The Stopwatch is used to make precise measurements of time; it also has the ability of saving the timed results to a list. This list of results can then be exported from the program to popular file formats, txt as a text file and jpg as a graphic file. 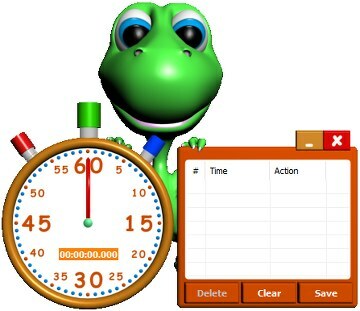 The program is extremely easy to use, there are three main buttons on the stopwatch, green is the start and stop button, used to start and stop the timer. Red is reset; it resets the current time and starts from zero again. Finally the blue button is the next time; it saves the current result on the list and continues recording the time. 947 3,048 LearningForKids.net <img src="http://www.oldergeeks.com/downloads/gallery/thumbs/Stopwatch1_th.png"border="0"> Aug 22, 2017 - 11:46 1.0 883.5KB EXE , out of 18 Votes.